While you've heard of traditional can koozies our solo style wedding cup koozie stands out from the rest! This wedding coolie was made to house plastic drinking cup from 16 ounces to 22 ounces and keep the beverages cool. This is the perfect way to cater to your guests koozie needs for both draft beer and mixed drinks! Made for solo cup type plastic cups, this personalized wedding koozie gets narrower towards the bottom for the perfect fit! Not only will it keep your guests drinks cold, but will also keep their hands dry as they can escape the sweaty cups that arise from mixed drinks (or frosty beers) on a cold day! 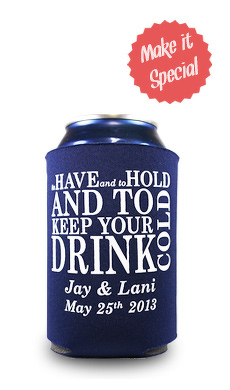 We have 25 koozie fabric colors as well as 25 printing colors so that you can create the perfect wedding cup coolie! We can either help create the art for your solo cup wedding coolies, or you can upload your artwork straight to us!